It is yet to be revealed what the genre of the film would be and many are expecting the film to be an intense one. Top star Suriya Sivakumar will next team up with ace filmmaker Selvaraghavan which was launched recently. The shooting of the film is currently underway in Chennai and is slated to be released during Deepavali this year. The makers have now announced the title of the film and have released the first look poster of the film which is being referred to as Suriya 36. The film has been titled NGK and Suriya will be seen playing the titular role. Suriya took to his social networking page and made the official announcement. “Dear all! Need your love for #NGK Director @Selvaraghavan !! A very Happy birthday!! #NGKdiwali2018 #Suriya36 @Sai_Pallavi92 @Rakulpreet @thisisysr @prabhu_sr @RelianceEnt @DreamWarriorPic ” wrote Suriya on his Twitter handle. The announcement was made the by the makers on the occasion of the director Selvaraghavan’s birthday. 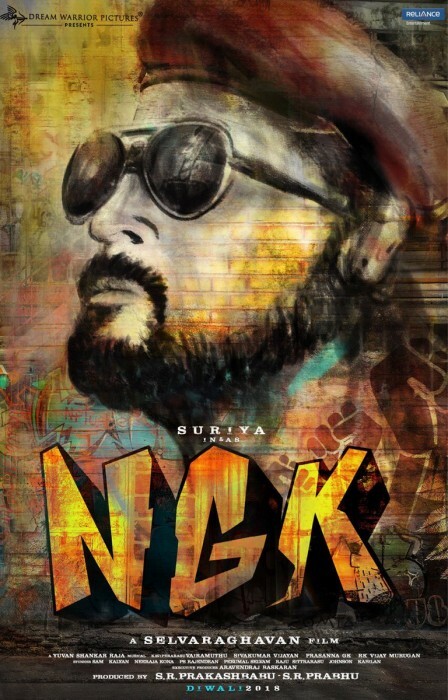 Suriya’s look in the poster hints that the actor could be playing a rebelistic character, either a singer or a poet. The folded fists in the poster also indicate that the film could be an intense drama, Ala Selvaraghavan style. The makers have roped in Sai Pallavi and Rakul Preet as the leading ladies in NGK and it is yet to be revealed what genre the film would be of , however fans are expecting the film to be an intense one. NGK is being produced by S.R.Prabhu under the banner Dream Warrior Films and will be their maiden production with Suriya in the lead role. “I am used to making raw and intense films and do not like any sort of compromise. In fact, none of my actors generally have a problem portraying the characters I sketch for them,” he further added. Also, during a recent Twitter chat, director Selvaraghavan opened up about NGK and said that it is his dream project. He went on to add that this is the first time since Pudhupettai that he has enjoyed scripting a story to the fullest. Well, this is quite a statement and is bound to add to the buzz surrounding NGK.